My maternal grandmother (“Nanny”) has definitely been my greatest source of inspiration, encouragement, and education in the kitchen! She is English/Canadian, so a lot of her recipes have come from that traditional heritage. One of the meals my mom remembers from growing up was the traditional Sunday Roast with potatoes, veggies, and Yorkshire Puddings. 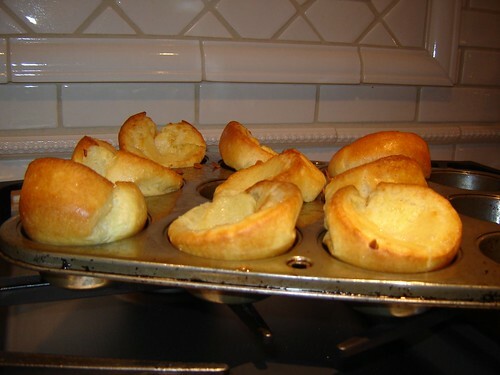 So last night, my mom and I made one of our favorite Nanny recipes to go with our pot roast – Yorkshire Pudding. 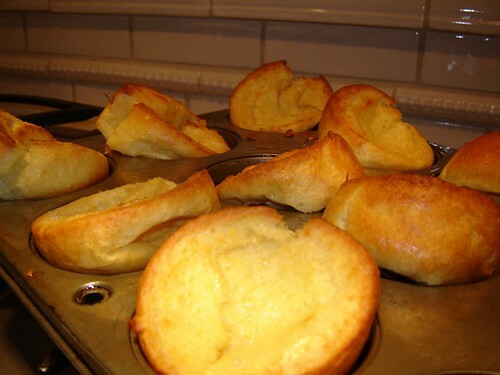 In some circles, these tasty treats are known as “popovers” because of the way they puff up and pop out of the pan when they bake. Make sure that all of your ingredients are at room temperature before you mix your batter. This is the #1 best tip for fluffy popovers! Don’t use too much hot grease in the preheated pan – just a tiny bit will work. Don’t open the oven while the yorkshires are baking. 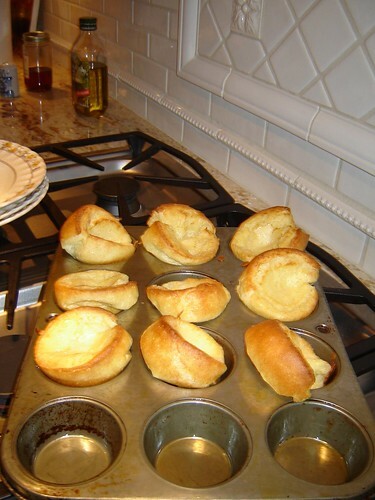 Serve popovers immediately so that they do not un-pop as they cool and fall. If you follow these easy tips, then this ends up being a very simple treat to make! In a medium bowl, whisk eggs for about 30 seconds. Add milk, and whisk again for 30 seconds. Slowly add the flour mixture to the egg mixture, whisking constantly to prevent lumps from forming. 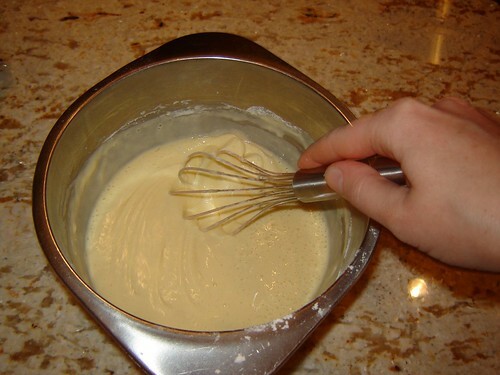 The batter should resemble the consistency of smooth pancake batter. 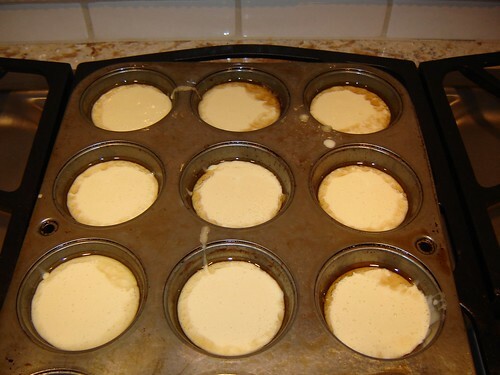 Drop about 1/4 teaspoon of Crisco into the bottom of each greased muffin cup. 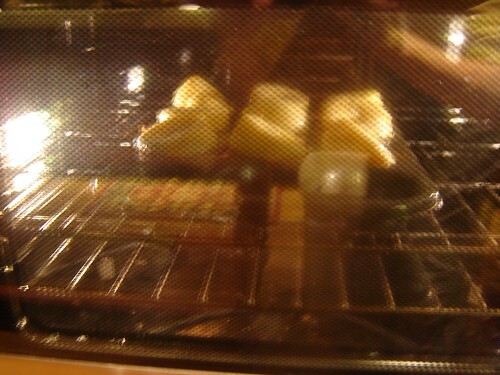 Place muffin tin in the pre-heated oven for about 2 minutes, until crisco is melted and slightly smoking. 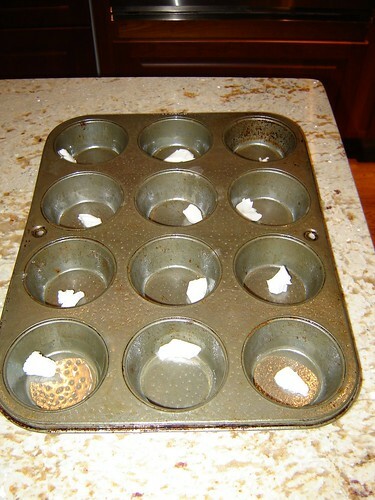 Remove from the oven and spoon batter into hot muffin cups about 2/3 of the way full. It’s okay if the recipe doesn’t fill all 12 cups – we usually get 9-12 out of this recipe. Here is the view from outside my oven about 15 minutes in, when the yorkshires popped! Serve with pot roast, roast beef, stew, or anything that has a nice gravy. These are also delicious with butter and raspberry jam, syrup. or sugar – for dessert or breakfast or tea time!